I’m planning to write a series of pieces about castles in the British Isles this month – there’s a lot of history here, and much of it would make good inspiration for games and stories. Castles are big, impressive structures built to withstand attack, pacify local dissidents, and protect those loyal to the lord. But they are more than just military structures – they are the homes of nobility, and they are big, imposing buildings which show the righteous power of those in charge. 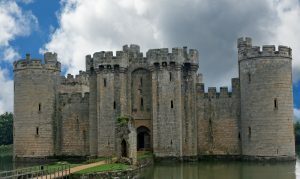 I thought I would start with Bodiam Castle for two reasons: First it is a great example of what we think a castle looks like, and second I’ve been there several times as it is not far from where i grew up (Maybe that’s why I think it is the most castley castle that ever castled!). 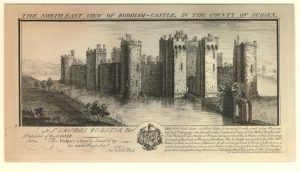 Bodiam is in East Sussex, not far from the coast. It is a large, square castle in the middle of a wide moat, and although it is now ruined, the curtain wall and general structure remains intact. There are enough of the internal walls left that we can see where the internal rooms would have been – there is no central keep, but the probably very lavish internal rooms were built into the walls, leaving a large ornamental courtyard in the middle. The water features around the castle were once very impressive, but they are now long gone. They would guide visitors in such a way that they would see the full glory of the castle as they approached – it was, by all accounts, a very impressive sight. People could enter the castle via the north drawbridge, but the main entrance is on the south side, where guests would first cross to a small octagonal island (which probably had some fortifications, now long gone), and from there across a drawbridge into the castle. Inside, the castle would have been as ornate as any manor house of the day. Large kitchens could prepare feasts for many guests in the great hall, and there was plenty of guest accommodation, which would no doubt have been nearly as lavish as the private quarters of the lord and lady. There was space for servants to live too, although that was smaller, and most likely darker and grimier. The castle was built for Edward Dalyngrigge, who was a political player in the 14th century. He was a second son, and thus inherited no land himself, but he married into a landed family, and then got close enough to the king that he was granted a “license to crenelate” his manor house. He didn’t. He had a castle built on a new location within his lands. He had, by this point, made a fortune as a member of a “free company” in France, which is to say he was a mercenary during the Hundred Years War. While the castle would have been a reasonable defensive structure, there were a few flaws (such as the moat being rather too easy to drain, and large windows overlooking the grounds) which lead historians to believe that it was built to look impressive more than to act as a defense against the French. This is compounded by the location, which is not ideal to stop a French invasion – they could have relatively easily avoided it had they attempted an invasion in Kent or Sussex. I am not saying this castle was a folly (I’ll write about one of them another day), it was a real castle with thick walls, firing slits, and everything else a castle needs, but it was intended more to be impressive than to actually fight. The location must have been somewhat reasonable, however, as during the second world war a pillbox was built in the grounds, this time to counter German invasion. Over the many years of its time as a seat of power, and then as ruin, it never actually saw action. The closest it came was during the War of the Roses when Sir Thomas Lewknor (the then lord) was accused of raising men at arms for the House of Lancaster. His own uncle, Thomas Howard, the Earl of Surrey, went to besiege the castle. No record remain of the siege, so more than likely Lewknor surrendered pretty quickly. Later, during the English Civil War, the castle was used a base from which attacks were mounted (for the Royalist cause) on Lewes and Haywards Heath, but Bodiam itself was not attacked. After the civil war many castles were partially dismantled so that they could not be used as fortifications again, and it here that the castle suffered most of it’s damage. But it was deemed reasonable to leave the oh so impressive curtain wall standing and most of the grounds remain intact. Edward Dalyngrigge died about three years after the castle was completed, and his estates passed to his son, who passed them to his wife on his death and she passed them to a cousin on her death… it was sold a couple of times over the centuries as well, and eventually ended up in the hands of Lord Curzon, who granted it to the National Trust in his will, in 1925. So what do we have? A castle which is not ideally placed to be tactically important, but is built to be as impressive as possible. It is built by an experienced mercenary who was politically astute. It changed hands many times, and yet despite the turbulent history surrounding the many owners it remained largely unaffected. You could use Edward Dalyngrigge as inspiration for a noble. I imagine him as brash, friendly, and yet full of his own worth – convinced that in his prime he could have defeated any foe, but he would rather tell tales of his glory days than prove it once more. His son john was also an astute political player, so he would perhaps be a little less rough and ready than his father, but just as silver tongued. Maybe the inappropriately placed castle is useful. While Dalyngrigge was assuredly no coward himself, perhaps a more cowardly noble won a “licence to crenellate” and used it to ensure he would be nowhere near any fighting – and in so doing weakened the kingdom’s defences. That is the sort of lord who would give in to a siege (by his own uncle no less) without a struggle no matter how strong his defences. Or maybe it is a site of mystery – the castle has just been bought or inherited by a new noble who does not know the full history of the place. Such a person may hire heroes to investigate the castle and grounds, or to assess the security of the place. Who knows what might live in a moat, or the other water features, the forest in the grounds, or even in the cellars of the castle itself!